The 2016 annual report on the Protection of the European Union’s Financial Interests (PIF Report’) is presented by the Commission in cooperation with the Member States under Article 325 of the Treaty on the Functioning of the European Union (TFEU). Where analysis of this information has identified problems or risks, recommendations are made to address those issues. ·the Hercule III financing programme helps to boost the operational and administrative capacity of Member States’ customs and other authorities. ·important guidance documents were prepared in the framework of the Advisory Committee for Coordination of Fraud Prevention (COCOLAF). ·the Commission adopted an action plan on VAT Towards a single EU VAT area — Time to decide, setting out measures to tackle the VAT gap and step up the fight against fraud. By the end of 2016, nine Member States had adopted a National Anti-Fraud Strategy. Two more Member States adopted their strategy at the beginning of 2017. Public procurement was also the topic of many measures taken, as Member States had to transpose the 2014 Directives into their national law by April 2016. Member States reported adopting measures against corruption and organised crime, plus other horizontal measures targeting tax havens, introducing e-tools for criminal proceedings, conducting anti-fraud training and raising fraud awareness. Moreover, the majority of Member States reported on the number and nature of measures taken to follow up on the 2015 recommendations. The Commission encourages all Member States to take the recommendations of this year’s report into consideration in a similar manner. In 2016, 19 080 (fraudulent and non-fraudulent) irregularities were reported to the Commission, involving a total of approximately EUR 2.97 billion. About EUR 2.43 billion concerns the expenditure sector of the EU budget. The number of irregularities detected fell by 15 % compared with 2015, and their financial value fell by 8 %. 1 410 irregularities were reported as fraudulent in 2016, involving EUR 391 million, covering both expenditure and revenue. Information on recoveries, financial corrections and other preventive and corrective measures is provided in the Annual Management and Performance Report, which as from 2016 includes the former annual Communication from the Commission to the European Parliament, the Council and the European Court of Auditors on the protection of the EU budget. Each year, under Article 325(5) of the Treaty on the Functioning of the European Union (TFEU), the Commission, in cooperation with the Member States, submits a report to the European Parliament and the Council on measures taken to counter fraud and any other illegal activities affecting the EU’s financial interests. The EU and the Member States share responsibility for protecting the EU’s financial interests and fighting fraud. Member State authorities manage approximately 74% of EU expenditure and they collect Traditional Own Resources (TOR). The Commission oversees both of these areas, sets standards and verifies compliance. It is essential that the Commission and the Member States work closely together to ensure that the EU’s financial interests are effectively protected. One of the main aims of this report is to assess this cooperation in 2016, and to see how it could be improved. This report provides a summary of measures taken at EU and Member State level in 2016 to counter fraud. It also includes an analysis of the main achievements of national and European bodies in detecting and reporting fraud and irregularities relating to EU expenditure and revenue. The reporting system has significantly contributed to the protection of the EU’s financial interests and to fighting fraud. The report is accompanied by five Commission Staff Working Documents 1 . After four years of negotiation, a political agreement was reached in 2016 between the Council, the European Parliament and the Commission at a trilogue meeting on 30 November 2016. The so-called PIF Directive is expected to be adopted in 2017. Member States will have two years to transpose the Directive into national law. The Directive will strengthen the existing legal framework by harmonising the definition of offences affecting the EU’s financial interests (fraud, corruption, money laundering and misappropriation) as well as the penalties and statutes of limitations for such cases. It includes cross-border VAT fraud cases for total damages of at least EUR 10 million. The Directive will replace the 1995 Convention on the protection of the European Communities’ financial interests and its protocols (the PIF Convention) 2 for those Member States bound by the Directive 3 . The negotiations on the Commission’s proposal for a Regulation on the establishment of the EPPO continued in 2016, under the Dutch and Slovak Presidencies. The Justice and Home Affairs Council meeting of 8 December 2016 considered the full text of the draft Regulation discussed during successive Presidencies. A majority of Member States considered the text as a good basis for further work and supported the principle of the establishment of the EPPO. The negotiations on setting up the EPPO through enhanced cooperation continued in 2017, in view of the lack of unanimity in the Council. In 2016, the Commission continued the evaluation of the application of Regulation (EU, Euratom) No 883/2013 concerning investigations conducted by OLAF. The evaluation, required by Article 19 of the Regulation, has to be submitted to the European Parliament and the Council by 2 October 2017. In 2016, anti-corruption remained a priority in the European Semester process of economic governance. Several Member States received recommendations to take action to improve transparency or step-up anti-corruption efforts in public administration, the judiciary and public procurement. The Commission continued its series of workshops under the EU Anti-Corruption Experience Sharing Programme for Member States experts. 4 Three workshops were held in 2016 on themes such as corruption in public procurement at the local level, political immunities and corruption in the private sector. OLAF contributed with its expertise to several European and international anti-corruption fora, in particular EPAC/EACN 5 . This network, chaired until November 2016 by OLAF’s Director-General, adopted the ‘Riga Declaration’ of November 2016 6 calling on European decision-makers to strengthen the fight against corruption. In September 2016, the Commission proposed in a single act an ambitious revision of the general financial rules accompanied by corresponding changes to the sectoral financial rules set out in 15 legislative acts concerning multiannual programmes 7 . In designing simpler and more flexible EU financial rules, the Commission has made sure that it does not weaken sound financial management, which remains a key objective. The proposal also strengthens rules on tax avoidance to be obeyed by EU implementing partners and clarifies that the duty to avoid conflicts of interest fully applies to all modes of implementation of EU funds (including at Member State level). It also consolidates the systems in place to protect the EU budget against fraud and financial irregularities 8 . It simplifies EU financial rules to help reduce the expense and time needed to implement EU funds to cut the number of errors. It should also increase the impact of the policies and their results on the ground. In order to better combat fraud against the EU budget beyond the borders of the EU, OLAF also negotiates anti-fraud provisions in EU international agreements such as association agreements and partnership agreements. In 2016, anti-fraud provisions were included in the EU-Armenia Comprehensive and Enhanced Partnership Agreement. The negotiations on the anti-fraud provisions in the Political Dialogue and Cooperation Agreement between the EU and Cuba were also finalised and the agreement was initialled on 11 March 2016. With the objective of strengthening investigative cooperation beyond the EU’s borders, OLAF concluded six administrative cooperation arrangements with partner authorities from non-EU countries and international organisations in 2016 9 . The Commission is considering updating the CAFS adopted on 24 June 2011 10 . The objective of the CAFS is to improve prevention, detection and investigation of fraud and ensure that adequate sanctioning, recovery and deterrence is high on the Commission’s agenda. The strategy has now been fully implemented, which means that all actions have been finalised or are ongoing. The focus is on sectoral strategies and action plans that tackle fraud in their specific policy areas. While keeping this approach, the updated strategy would further emphasise incorporating anti-fraud measures in the Commission’s internal control systems, and in particular reporting on implementation of anti-fraud measures. The updated CAFS is planned to include a specific chapter on Traditional Own Resources (TORs) as a follow-up to the results of the 2016 audit of the Commission's Internal Audit Service (IAS) on the "Performance and Coordination of Anti-fraud activities in the Traditional Own Resources (TOR) area". All Commission departments (48 in total) have introduced sectoral Anti-Fraud Strategies (AFS) for the policy area under their responsibility. Each of these strategies must be regularly updated to reflect changes in the anti-fraud environment. The Commission’s Fraud Prevention and Detection Network (FPDNet) endorsed an updated methodology for such strategies. This consisted of further integrating anti-fraud measures into the strategic programming and planning (SPP) and monitoring cycle — from identifying the risk of fraud, to fraud control and monitoring. In this way, anti-fraud strategies form an integral part of Commission risk management, while maintaining the specific attention that fraud requires. The 16 Commission departments that updated their strategy in 2016 reported that they had used the updated methodology and the guidance for the development of DGs’ anti-fraud strategies provided by OLAF. In 2016, the Executive Agency for Small and Medium Enterprises (EASME) used the updated methodology to update its anti-fraud strategy. The agency’s fraud risk assessment is now integrated in the annual risk assessment process. The main fraud risks that EASME faces are plagiarism and double funding, and intentionally inflated or false cost claims. These risks and actions to mitigate them are monitored closely in the annual risk management process. EASME took mitigating measures and reinforced controls for these risks, while bearing in mind the principle of costs and benefits. This means that risk-based controls are applied and that high-risk projects are monitored more closely. For certain risks (e.g. plagiarism), EASME participated in testing tools for the H2020 programmes, which are applied in all Commission departments active in research. ·training activities and conferences, including digital forensic training for staff employed by law enforcement agencies in the Member States and partner countries, covering around 30 % of the budget. The Commission (OLAF) started to receive the first reports, reflecting the tangible results of activities carried out since the programme started in 2014. Substantial successes were reported in relation to smuggled and counterfeit cigarettes and tobacco: seizures were made with the help of equipment and training funded under the programme 14 . Member States were asked to report a maximum of three main anti-fraud measures. This summary gives a good overview of trends in and priorities for the anti-fraud measures implemented by Member States, but it is not exhaustive; many more measures have been taken which are detailed in an accompanying document 15 . In 2016, Member States reported on 80 measures to protect the EU’s financial interests and fight fraud for the programming period 2014-2020. Member States’ measures covered the entire anti-fraud cycle, mostly in the area of shared management, followed by measures on public procurement, conflicts of interest, corruption, AFCOSs 16 , the definition of fraud, anti-fraud strategy, organised and financial crime and whistle-blowers. Concerning the anti-fraud cycle, most of the measures concerned prevention, followed by detection, investigation and prosecution, recovery and sanctions. The majority were sectoral (73 %) rather than general (27 %). Twenty of the sectoral measures concerned revenue in the fields of tax fraud (60 %) and customs (40 %). Forty-one measures concerned expenditure, covering all areas of the budget. By the end of 2016, nine Member States had adopted a national anti-fraud strategy and sent it to the Commission 17 . This is more than in 2015, and shows the Member States’ commitment to adopting a strategic approach to combating fraud and irregularities detrimental to the EU and national budgets. The Commission welcomes these developments and calls on all other Member States to draft such strategies. Several Member States adopted measures to improve such coordination services, including Denmark (with an AFCOS anti-fraud manual), France (a national anti-fraud strategy), Croatia (a management methodology to promote fraud prevention), Latvia (an operational strategy and action plan for 2017–2019), Malta (fraud prevention activities with other AFCOSs), the Netherlands (the creation of an AFCOS team), and Finland (launching a national AFCOS network). There were a number of measures on public procurement, as Member States were required to transpose Directives 2014/23 18 , 2014/24/EU 19 and 2014/25/EU 20 into their national law by April 2016. Ten Member States 21 reported taking measures to harmonise their national law on public procurement with EU law. Eleven Member States have yet to transpose the three Public Procurement Directives in full. Belgium, France, Lithuania, Romania, Slovenia and the Czech Republic reported measures against corruption and organised crime in 2016. Various other measures were reported by the following Member States: Belgium (targeting tax havens), Spain (improved fraud detection), France (protection of whistle-blowers), Croatia (anti-fraud training), Italy (inspection campaigns), Lithuania (an e-tool for criminal proceedings), Hungary (anti-fraud training and more cooperation), the Netherlands (fraud awareness) and Austria (a central register of accounts). (d)plan and focus their audits and controls on the basis of risk analysis and performing IT tools and use tools such as ARACHNE 26 , IMS and the Fraud Risk Assessment Tool. Some Member States 27 reported that a balance between trade facilitation and the protection of the EU’s financial interests had been achieved; others 28 are implementing measures to ensure this balance. Eighteen Member States 29 forwarded information received from other Member States or the Commission departments to their national competent bodies for risk assessment and analysis. A number of Member States 30 reported that they have taken into consideration the Commission’s recommendation to adapt their yearly planning of staff and resources required for verifying information received in the form of voluntary admissions. Several Member States 31 reported that they have included such information in risk analysis and management to minimise risk and use it for post-clearance examination. The six Member States 32 that were specifically recommended to strengthen their systems in relation to detection and/or reporting of fraud, reported on the progress made. France and Lithuania explained the measures it had taken to improve the reporting of irregularities. Spain noted an increase in irregularities reported due to the efficiency of the detection system. In relation to the use of risk analysis and IT tools (ARACHNE, IMS and the Fraud Risk Assessment Tool), some Member States 33 reported that they make use of some of these tools combined with their own tools, while other Member States 34 reported that they mainly use their own alternative tools. The IMS is widely used by all Member States 35 that provided information regarding this recommendation 36 . In 2016, 19 080 irregularities (fraudulent and non-fraudulent) were reported to the Commission, 15 % fewer than in 2015. They involved a total of approximately EUR 2.97 billion, 8 % down from the previous year. The detection of an irregularity implies that corrective measures have been taken in order to recover the irregular financial amounts involved and that criminal proceedings have been begun if fraud is suspected. The number of irregularities reported as fraudulent (which includes cases of suspected or established fraud) and the related amounts cannot be seen in correlation with the level of fraud affecting the EU budget. Irregularities reported as fraudulent rather indicate how many cases of potential fraud are being detected by Member States and EU bodies. In 2016, 1 410 irregularities were reported as fraudulent (i.e. 6 % of all irregularities detected and reported 38 ), involving EUR 391 million (representing 13 % of the total financial amounts affected by irregularities 39 ), covering both expenditure and revenue. Differences exist between sectors, as shown in Table 1. Compared to 2015, the number of fraudulent irregularities reported in 2016 fell slightly, by 3 %, while their financial impact decreased by 39 %. 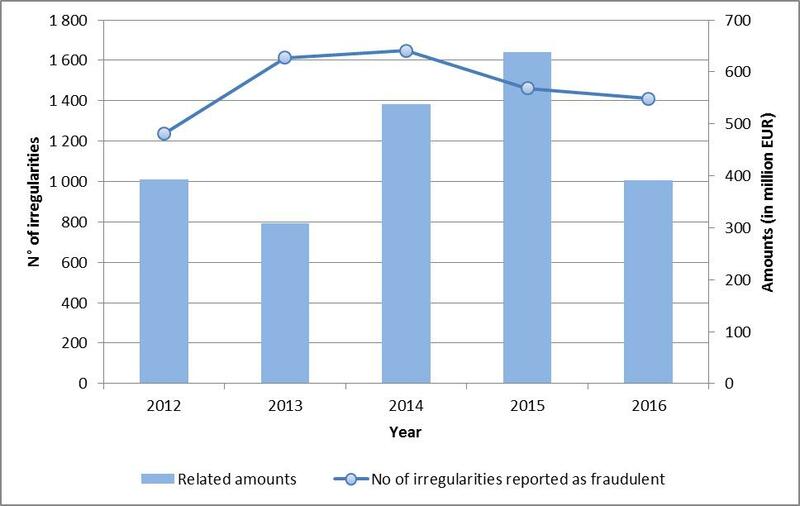 Looking at the last 5 years (2012-2016), the number of irregularities reported as fraudulent has changed little since 2013: it was 14 % higher in 2016 than in 2012, 4 % below the five-year average. The financial impact, however, fluctuates greatly, as the amounts at stake can be affected by individual cases involving very large sums. Chart 1 shows the overall trends over the last five years. There are some minor differences in the year-to-year variations between revenue and expenditure. A breakdown of all fraudulent irregularities reported in 2016, by Member State and by budget sector, is set out in Annex 1. In 2016, the Commission was notified of 17 670 irregularities not reported as fraudulent (about 15 % less than in 2015). The figures fell for all sectors except direct expenditure. The financial impact was almost unchanged at approximately EUR 2.58 billion, as shown in Table 2. Annex 2 shows a breakdown of all non-fraudulent irregularities reported in 2016 by Member State and by budget sector. Regulation (EU) 2015/1525 40 , amending Regulation (EC) 515/97 41 on Mutual Administrative Assistance in customs matters, provides for the creation of two centralised databases containing information on container movements and on goods entering, leaving and transiting the EU. These databases became operational on 1 September 2016. In addition, the following acts were adopted in 2016 to foster mutual assistance in customs: Delegated Regulation (EU) 2016/757 42 , Implementing Regulation (EU) 2016/345 43 and Implementing Regulation (EU) 2016/346 44 . Regulation (EU) 2015/1525 introduced a new Article (43b) requiring the Commission to assess the need to extend the container status message (CSM) 45 directory 46 and the import, export and transit (IET) directory to export data not limited to excisable goods. The Commission is also required to assess the feasibility of extending the transport directory to data on the import, export and transit of goods by land and air. Given that these directories became operational only on 1 September 2016, it would be premature to expand them to other categories of data at this stage. However, the Commission is currently conducting the assessments, focusing in particular on the added value of the additional export data. In this context, internal consultations and consultation with the Member States’ authorities are ongoing 47 . As to the feasibility of extending the transport directory to other means of transport, Regulation (EC) 515/97 already provides the legal basis for receiving data. The focus is currently on identifying sources of additional data, possibly using data collected under the Import Control System (ICS) II project. The Commission will present its findings in the next PIF report. ·the storage and analysis of relevant data. By the end of 2016, AFIS had 8 700 registered end-users on behalf of more than 1 800 competent services in Member States, non-EU partner countries, international organisations, Commission departments and other EU bodies. In 2016, AFIS users exchanged 16 900 mail messages. A total of 13 800 cases were available in the AFIS mutual assistance databases and modules. The Irregularity Management System (IMS), operated under the AFIS platform, received 43 600 new communications on irregularities from Member States and candidate countries. ·the Import, Export and Transit (IET) directory. The AFIS received 182 million CSMs in 2016. The IET directory contains declaration data on import and transit of goods and on the export of excise goods. Some 2 million export declarations and related messages were processed. The Anti-Fraud Transit Information System (ATIS) received information on 6.7 million new transit consignments. These are also available in the IET directory. The AFIS was used for secure access and exchange of information in eleven Joint Customs Operations (see next section). JCOs are brief, coordinated and targeted operations implemented by customs authorities to combat illicit cross-border trafficking in goods. OLAF coordinated and cooperated with Member States in 12 JCOs and other operational actions. One JCO was organised by the World Customs Organisation with intelligence support from OLAF. Four JCOs were organised in cooperation with four Member States and financed by OLAF. ·made its permanent operational coordination room available to the authorities involved. The Magnum JCO targeted smuggling of tobacco products transported by road into EU territory across the EU’s eastern border. It was coordinated by the Estonian customs administration and OLAF, with the involvement of five Member States. Around 11 million cigarettes were seized during the operation. The Warehouse III JCO targeted smuggling and removal of excise goods (tobacco products, mineral oil/ fuels and certain alcohols) from duty and tax suspension arrangements. It was coordinated by the Finnish customs administration and OLAF with the involvement of all Member States and the support of Europol. The results of this operation are still under evaluation. The Orion JCO targeted goods originating from non-EU countries and released into free circulation using customs procedure 42 48 . It was coordinated by the Greek customs administration and OLAF with the involvement of the customs authorities of 23 Member States in close cooperation with the tax authorities. Europol supported the operation. This JCO led to customs uncovering several instances of undervaluation and misclassification of goods at import, as well as a string of missing traders who ‘disappeared’ in order to evade customs duties and VAT. The Wafers JCO targeted counterfeit semiconductors imported into the EU from Asia by post/express courier services. The results of this operation are still under evaluation. It was coordinated by the Dutch Customs and OLAF with the involvement of 12 Member States and the support of Europol, in close cooperation with the industry. Operations Kerguelen, Kiribati, Killick, Kheops and Pascal — These regional maritime surveillance operations, coordinated by French customs targeted the detection of illicit trafficking of sensitive goods by sea, in the Atlantic and the Mediterranean. The operations resulted in seizures of over 8 tonnes of cannabis resin and 400 kg of cocaine and the arrest of 17 people. The Hansa joint action, driven by the United Kingdom Customs in cooperation with Europol and the support of OLAF, targeted internal movement of illegal excisable goods, mainly cigarettes. The final evaluation is still ongoing. Operation Octopus organised by French customs in cooperation with OLAF, targeted revenue fraud involving customs procedure 42 and helped uncover various fraudulent companies and large amounts of evaded customs duties and VAT. As a result of the increased controls, more than 6 000 counterfeit items were seized. Operation Gryphon II, organised by the World Customs Organisation with the participation of OLAF, targeted the illicit tobacco trade. The operation resulted in seizures of 729 million cigarettes, 287 000 cigars and 250 tonnes of other tobacco products, as well as components of machines used to manufacture cigarettes, bulk cash and more than 12 million excise duty stamps. In the context of Article 19 of Regulation (EC) 515/97 the list of mutual administrative assistance agreements 49 in force providing the legal basis for the exchange of information with third countries on fraud and irregularities was expanded to include the following partners in 2016: Kazakhstan, Ivory Coast, Ghana and Kosovo*. In addition, negotiations to update the previous agreement were finalised with Armenia. Negotiations with Mercosur (Argentina, Brazil, Paraguay and Uruguay) have made good progress. The EU also made progress in ongoing negotiations on including an anti-fraud clause in free trade agreements with Japan, the US, Mexico, Mercosur and Tunisia. The Commission is reviewing the preliminary outcome of its 2013 Communication Stepping up the fight against cigarette smuggling and other forms of illicit trade in tobacco products — A comprehensive EU strategy 50 , which came with a comprehensive action plan. A progress report giving an overview of the main initiatives taken since then, an analysis of the illicit market in tobacco products and suggestions for further reflection and action was published in May 2017 51 . The Commission adopted an action plan Towards a single EU VAT area — Time to decide 52 on 7 April 2016. It set out 20 measures to tackle the VAT gap and fight fraud 53 and proposed addressing the provisional VAT system’s current exposure to so-called missing trader intra-Community fraud by setting up a definitive VAT system based on the destination principle and implementing more urgent measures to tackle the VAT gap. The VAT gap report 54 published in 2016 revealed a VAT gap of EUR 159.5 billion. An expert group was set up under the Fiscalis programme to allow Member States to exchange good practice in measuring the VAT fraud gap. On 21 December 2016, the Commission adopted a proposal for a Council Directive allowing a generalised reverse charge mechanism 55 (GRCM) to be applied temporarily if a certain number of Member States requests it. Member States and the Commission continued their discussion on new ways to boost the activities of the Eurofisc network in order to detect fraud schemes more efficiently. Negotiations on an EU agreement on administrative cooperation and recovery assistance in VAT with Norway were concluded and the agreement is set to be signed in 2017. Most Member States reported measures to fight customs fraud. Denmark and France reported on a national risk analysis; Italy and Portugal reported on a national customs risk assessment; while Austria and Slovenia reported on a national customs control strategy. Measures to fight organised and financial crime and anti-smuggling were reported by Bulgaria, Greece and Finland. Measures to fight tax evasion and VAT fraud were reported by Bulgaria, Czech Republic, Ireland, Lithuania, Latvia and Poland. The number of irregularities reported as fraudulent for 2016 amounts to 513 (FFL 57 is 11%). This is 32 % lower than the five-year average (749 irregularities for the period 2012-2016). The affected amount of TOR estimated and established (EUR 83 million, FAL 58 is 15%) in 2016 is 30 % lower than the five-year average (EUR 119 million). Inspections by anti-fraud services and customs controls carried out at the time of goods clearance were equally successful methods of detecting fraudulent cases. In terms of amounts, inspections by anti-fraud services were the most fruitful. The Commission services' inspection on TOR in November 2016 in the UK found significant weaknesses in the management and control of undervalued imports of textiles and footwear. OLAF also concluded an investigation in March 2017 on the undervaluation of textiles and footwear imported to the UK from the People’s Republic of China. It found that appropriate measures were not taken to prevent systematically undervalued imports of textiles and footwear from China from entering the EU through the UK. This resulted in very significant losses to the EU budget between 2013 and 2016. These elements led the Director-General for Budget to make a reservation in the 2016 Annual Activity report on the inaccuracy of the TOR amounts transferred to the EU budget by the United Kingdom since 2013. The Commission is following up with the UK on the findings of its audit and the OLAF reports. In the event the UK does not take appropriate corrective action, the Commission will take all appropriate measures to protect the financial interests of the Union including, where appropriate, the legal action envisaged by the Treaties. The number of irregularities not reported as fraudulent was 4 134, which is 9 % lower than the five-year average (4 532 for 2012-2016). The affected amount of TOR estimated and established was EUR 454 million, which is 28 % higher than the five-year average (EUR 355 million). Although the total number of fraudulent and non-fraudulent cases dropped from 5 514 cases in 2015 to 4 647 in 2016 (down by 16 %), the total TOR amounts involved increased from EUR 445 million to EUR 537 million (up 21 %). Non-fraudulent irregularities were primarily detected by means of post-clearance controls. In 2016, solar panels were most affected by fraud and irregularities in monetary terms. In many instances irregularities involving solar panels were detected following a mutual assistance notice issued by OLAF. This underlines the importance of investigations conducted by OLAF to detect irregularities. OLAF opened 40 investigations into suspected evasion of import duties. It concluded 30 investigations and made 71 financial recommendations to EU national customs authorities for the recovery of evaded duties, worth EUR 103.7 million. Eight recommendations for judicial action were sent to EU national judicial authorities. Seven Member States reported taking anti-fraud measures specific to agricultural funds as follows: Germany organised anti-fraud training, Greece adopted measures on fraud prevention, Luxembourg focused on detecting fraud in agriculture, Poland carried out a fraud risk analysis for agriculture, Slovenia introduced a computerised accounting system, Slovakia introduced new internal procedures and checklists, and the United Kingdom implemented sectoral anti-fraud strategies. The Common Agricultural Policy (CAP) is financed by two funds, the European Agricultural Guidance Fund (EAGF — about 80 % of the CAP budget) and the European Agricultural Fund for Rural Development (EAFRD — the remaining 20 %), which function differently. The EAGF follows an annual implementation, while the EAFRD finances multiannual programmes. The EAGF is divided into two main areas: direct payments to farmers and market support measures. The trend over the last five years of irregularities detected and reported by Member States to the Commission reflects these differences, with the EAGF showing an even curve and the EAFRD reflecting the multiannual cycle. The pattern of irregularities detected by Member States confirms the higher inherent risk of EAFRD investments. However, detected irregularities related to market support measures also indicate that more could be done in this area. Of the irregularities reported as fraudulent by Member States over the last five years, 60 % concern the EAFRD and 40 % the EAGF. The FFL 60 is 12.5 %, while the FAL 61 is 24 %. For the EAFRD, the most frequently detected modus operandi is the use of false or falsified supporting documentation. However, in the last two years, ‘ethics and integrity’ breaches (a category which includes cases of ‘corruption’ and ‘conflicts of interest’) have been rising. They were frequently detected in 2016 and may be linked to the decentralised management structure of many EAFRD programmes. On the other hand, the fact that so many cases are detected and reported also implies that Member States are paying increasing attention to these issues. Fraudulent irregularities in the EAFRD over the last five years represent about 0.5 % of payments. For the EAGF, over the last 5 years, fraudulent irregularities represent a smaller percentage of budget commitments than for the EAFRD. The impact on direct payments is 0.03 %. However, the situation is different for market measures (which represent only 7 % of the EAGF commitments): the impact on the payments is 1.1 %. The main measures concerned are: ‘Fruit and vegetables’, ‘Products of the wine-growing sector’ and ‘Pigmeat, eggs and poultry, bee-keeping and other animal products’. The financial amounts reported mainly reflect significant financial corrections imposed by the Commission on the Member States, following its own audits. National authorities have to recover the unduly paid amounts from the beneficiaries. This shows that due to the Commission's audits the overall system is working properly, but that Member States could do more to ensure regularity and legality of expenditure in this area. The most frequently detected modus operandi categories for the EAGF are ‘false or falsified: declarations, supporting documents, request for aid’ and ‘declaration of fictitious product, species and/or land’, in line with previous years. Trends in non-fraudulent irregularities are as described in section 4.1.2. For EAGF expenditure, there is again a significant difference between direct payments and market measures. While, for the former, the impact on payments over the last five years is 0.07 %, for the latter it is 1.5 %. 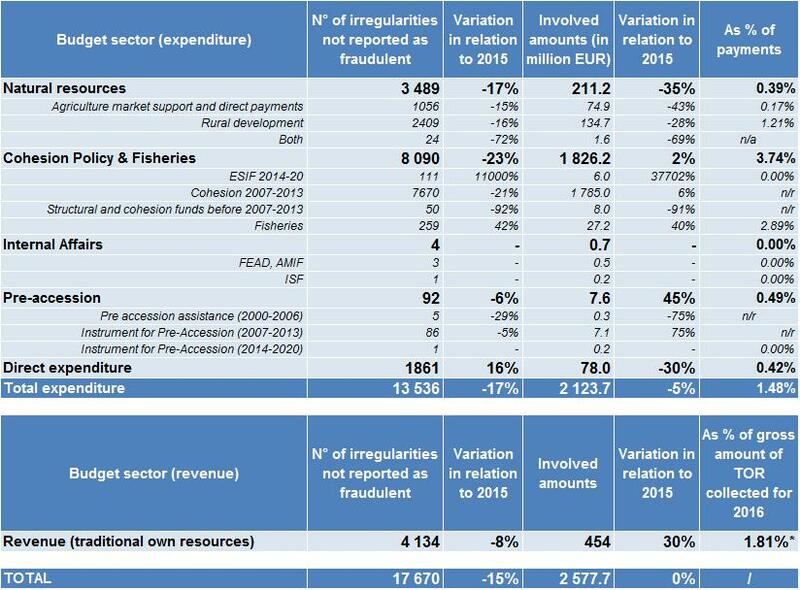 For the EAFRD, the impact on 2012-2016 payments of non-fraudulent irregularities is 2.1 %. Financial recommendations by OLAF over the last five years are stable at about EUR 60 million per year. Belgium on conflict of interest, Bulgaria on administration of irregularities and ARACHNE, Denmark on managing suspected fraud cases, Germany on European Social Fund management and control systems as well as self-assessment of fraud risks in the European Regional and Development Fund, Ireland on anti-fraud measures specific to ERDF, Finland concerning their beneficiary information system, Croatia on irregularity management, Italy on preventing fraud in fisheries, Cyprus on a fraud risk self-assessment tool, Luxembourg on ARACHNE and a fraud risk self-assessment tool, Malta on irregularity reporting, the Netherlands and the United Kingdom on ARACHNE, Austria on a verification procedure, Poland on IT tools in public procurement, Slovenia on computerised accounting system, Finland on anti-fraud training, and Sweden on economic crime and risk analysis. 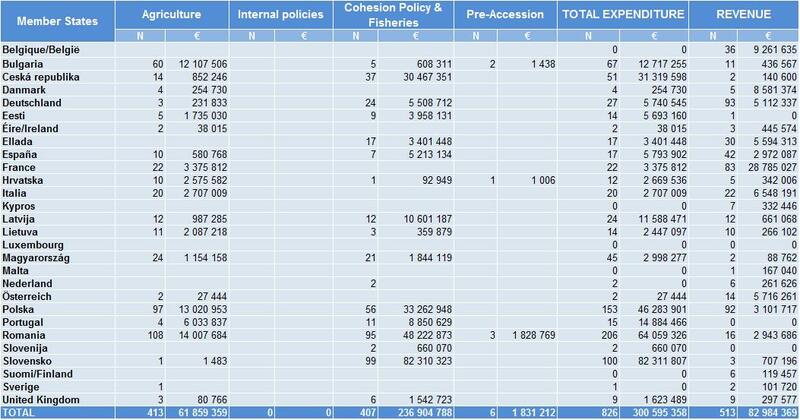 In comparison with the other budget sectors, analysis of cohesion policy involves a higher level of complexity because the information received (reported irregularities) relates to different programming periods governed by different sets of rules. Furthermore, the programming cycles are multiannual and this significantly affects the underlying trends. Given the similarity in the management of the funds, fisheries and cohesion policy are analysed together. In 2016, 8 497 irregularities were detected and reported (22 % less than in 2015 62 , but 25 % more than the average for the last five years). They concern four different programming periods, with the largest share relating to 2007-2013 (97 %) and only 115 to the 2014-2020 programme. The financial amounts affected by irregularities in 2016 came to EUR 2.06 billion, remaining fairly stable (5 % less than in 2015 and 8 % more than the average of the last five years). No major shifts in trends were identified in comparison to previous years, in terms of types of irregularities detected and detection and reporting efficiency. 407 fraudulent irregularities were detected and reported, 4 % more than in 2015, while still over 17 % more than the average of the last five years. The bulk of reported irregularities were for 2007-2013, therefore this year’s analysis focused on the whole programming cycle 63 . For the whole period, 1 750 fraudulent irregularities were detected and reported by national authorities, worth EUR 1.48 billion, with a fraud detection rate of 0.42 %. The detection rate is higher for programmes contributing to the ‘convergence’ objective. The European Territorial Cooperation programmes (ETC), by contrast, the detection rate is anomalously low (0.1 %). 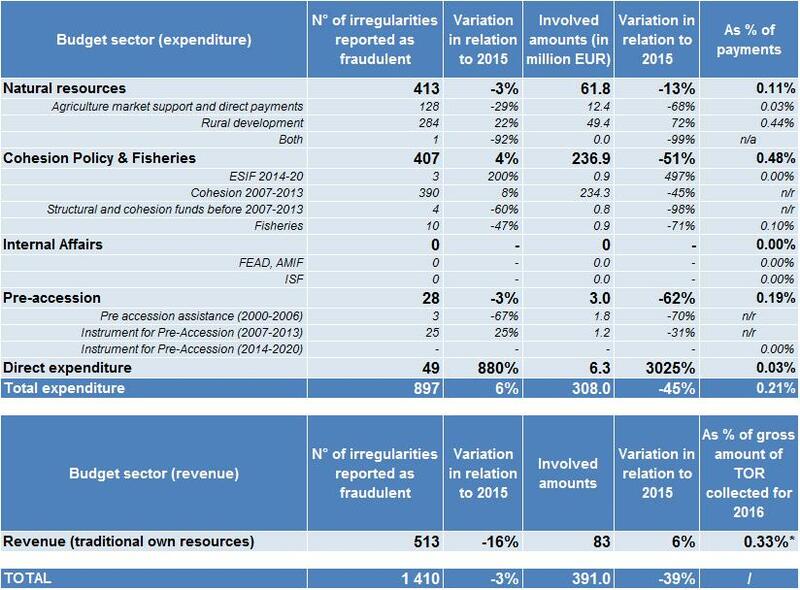 The priorities areas with the highest fraud indicators are: ‘Tourism’, ‘Research and technological development (R&TD)’, ‘Transport’, ‘Investment in social infrastructure’ and ‘Technical Assistance Fisheries’. 8 090 non-fraudulent irregularities were detected and reported, almost 23 % less than in 2015 and 26 % more than the average of the last five years. Over the 2007-2013 programming period, 35 360 non-fraudulent irregularities were detected and reported, worth almost EUR 7.3 billion, an irregularity detection rate of 2.1 %. The priorities areas with the highest indicators are the same as for fraudulent irregularities. The bulk of OLAF’s financial recommendations concerns cohesion policy. OLAF recommended recovery of EUR 353 million. The analysis of irregularities relating to indirect management focuses on Pre-accession instruments. Reported irregularities still concern two main periods. The 2000-2006 Pre-Accession Assistance (PAA) programmes, aimed at preparing the accession waves of 2004 and 2007, and the 2007-2013 Pre-accession instruments (IPA) used in the European Neighbourhood policy, which mainly address the Balkan countries and Turkey. Overall, reported irregularities were unchanged from 2015, while the five year trend (2012-2016) shows a steady decline, due to the phasing out of initiatives linked to the latest enlargement waves. In 2016, only eight irregularities, involving EUR 2 million, were reported in relation to PAA (as against 15 in 2015); 111, affecting EUR 8.3 million, were reported in relation to the IPA (as against 109 in 2015). Regarding PAA, only three fraudulent irregularities were detected and reported, worth EUR 1.8 million. In relation to the IPA, the number of fraudulent irregularities detected increased to 25 (from 21 in 2015), involving EUR 1.2 million. The main area concerned is still rural development support. As a result of its investigations in these areas, OLAF recommended that the Commission recover EUR 7.1 million. Statistics on direct management are based on recovery orders issued by Commission departments that are recorded in the Commission’s Accrual-Based Accounting System, ABAC. In 2016, ABAC recorded 49 recovery items classed as fraudulent 64 , which accounted for EUR 6.25 million. Comparing this to the total funds effectively disbursed, the fraud detection rate is 0.03 %, a level that has remained stable over the past five years. Regarding non-fraudulent irregularities, 1 861 recovery items totalling EUR 78 million were recorded in 2016. Over a five-year period, the irregularity detection rate remained stable at around 0.5 %. Following investigations in these areas, OLAF recommended the recovery of EUR 22.3 million. The 2016 meeting of the Advisory Committee for Coordination of Fraud Prevention (COCOLAF) bringing together Member States experts provided an opportunity to discuss the main developments in the fight against fraud and the preparation of the report Protection of the European Union’s financial interests — Fight against fraud 2015, required under Article 325 TFEU. ·launch communication activities on fraud prevention and deterrence. ·Reporting and Analysis sub-group: Handbook on the requirement to report irregularities 66 , which provides guidance on common aspects of Member States’ reporting of irregularities in connection with EU budget expenditure as part of shared management for the 2014-2020 programming period. ·Fraud Prevention sub-group: ‘General Guidelines on National Anti-Fraud Strategies, for Member States drawing up their national strategy. The document is a revised and enlarged version of the 2014 guidelines: it is a more comprehensive document covering all shared management expenditure and includes concrete examples of Member States’ best practices. Both documents were drafted following a collaborative approach with Member States’ experts, coordinated by OLAF. The third AFCOS Group meeting took place on 27 October 2016 and was an opportunity for coordination services to discuss key factors for successful investigative cooperation with OLAF. OLAF presented several developments in different policy areas, e.g. the evaluation of Regulation 883/2013 and the European Public Prosecutor’s Office (EPPO). In addition, the OLAF Anti-Fraud Communicators’ Network subgroup met in 2016 to discuss the role of investigative journalism in the fight against EU-wide fraud, share experience on a Transparency International anti-corruption project and participate in a hands-on session on how to develop a successful communication strategy, among other activities. The Council’s Working Party on Combating Fraud (GAF) exchanged views with the Commission on anti-fraud matters. Four GAF meetings took place in 2016: three under the Dutch presidency and one under the Slovak Presidency. ·the publication, in the most severe cases, on the Commission’s website of information related to the exclusion and/or the financial penalty, in order to reinforce the deterrent effect. This new system represents a significant improvement in the application of rules on administrative sanctions with respect to fundamental rights, independence and transparency. EU institutions, agencies and bodies can now only decide to impose sanctions on unreliable economic operators after obtaining a recommendation 69 from the new centralised Panel 70 . The Panel assesses cases where there is no final judgment or final administrative decision. It has no investigative powers. In principle, the panel bases its assessment on facts and findings resulting from audits performed under the responsibility of the competent Commission service or investigations conducted by OLAF. The Panel is composed of a standing high-level independent Chair who took office on 24 November 2016, two permanent Members representing the Commission, and one ad hoc Member representing the authorising officer of the service 71 requesting the recommendation. The Panel respects the right of defence of the economic operator concerned and applies the principle of proportionality 72 . In 2016, 21 cases relating to 33 economic operators were addressed to the Panel through its permanent secretariat by different authorising services, including 14 from the Commission, five from executive agencies, one from an office and one from a decentralised agency. In 2016 the Panel adopted three recommendations 73 . ·non-publication of information on administrative sanctions on the Commission website, either due to the need for confidentiality of investigations, or to respect the principle of proportionality where a natural person is concerned. The Commission gives a warm welcome to European Parliament resolution and in particular its support for the recent Commission initiatives in the fight against fraud, the EPPO and the PIF Directive. The Commission notes the generally constructive and positive tone of the resolution and can give a positive follow-up to a good number of the recommendations. The Commission stresses that interpreting an increase in irregularities reported by Member States as a negative development, or a decrease as a positive development, is too simplistic and might be misleading. National Anti-Fraud Strategies are only compulsory for candidate countries. The Commission is encouraging Member States to draft such strategies and supports them by facilitating the exchange of best practices and know-how 75 . For the detection of irregularities, the Commission has already made specific IT tools available to Member States, such as ARACHNE, IMS and the Fraud Risk Assessment Tool. The Commission stresses that it is implementing the action plan VAT — Towards a single EU VAT area and the 20 measures to tackle the VAT gap published on 6 April 2016 76 . The Commission is committed to fighting trade in illegal and counterfeit goods and is continuously working with the Member States to develop a common risk management framework to ensure equivalent levels of risk-based customs control throughout the EU. The Commission regularly carries out on-the-spot inspections in Member States aiming to ensure that national management and control systems comply with EU customs law. The Commission takes note of the European Parliament’s interest in more detailed information on recovery from legal residents of non-EU countries of mismanaged EU funds under direct management and will try to elaborate more on this specific aspect in next year’s report, within the limits of the information available. As regards systematic analysis of public procurement errors, sufficient data is required to perform meaningful analysis. In addition to the irregularity reporting related to EU funds, to gather such data, the Commission has taken steps to explore ways of setting up an irregularity database at EU level that would also include public procurement irregularities not related to EU funds. To this end, a feasibility study is planned to be finalised by June 2017. The Commission will attempt to look in more depth into the high level of fraudulent cases in R&TD, innovation and entrepreneurship 77 . ·Better reporting: Regarding the request for uniform reporting principles in all Member States, the Commission is finalising a working document prepared in cooperation with experts from the Member States on the reporting of irregularities, dealing specifically with the issues which have caused the greatest problems. The Commission is also of the opinion that the establishment of an anti-fraud coordination service (AFCOS) in all Member States already an important step in the right direction. The AFCOS network could be an appropriate framework for such cooperation to develop. ·Better controls: The Commission has already taken specific actions, under the current legal framework, to strengthen its supervisory role, aiming to improve the Member States’ management and control systems and reduce the error rates. The Hercule III programme is currently subject to an independent mid-term evaluation. The Commission will submit the results to the European Parliament and the Council by 31 December 2017. ·The PIF Directive and EPPO Regulation: The Commission welcomes the political agreement reached by the Council and European Parliament on the PIF Directive and looks forward to its adoption. It supports the establishment of the EPPO with as many Member States as possible participating, while taking the view that the EPPO could be effective even if not all Member States participate, and supports the current efforts to establish enhanced cooperation. ·Tobacco: In response to the European Parliament’s request, from today’s perspective, the anti-fraud agreements with JTI, BAT and ITL are due to expire in 2022 and 2030 respectively. The Commission has just presented a report on the implementation of the 2013 strategy 78 . This report includes lessons learned with regard to the phenomenon of ‘cheap white’ cigarettes. On the basis of stakeholders’ responses, once its evaluation is complete, the Commission may consider further measures in 2018. OLAF has steadily reduced the overall length of its investigation cases from an average of 23.6 months in 2012 to 21 months in 2015. The Commission is currently evaluating Regulation 883/2013, and will submit an evaluation report to the European Parliament and the Council by October 2017. The procedure for the appointment of a new OLAF Director-General has already started and the European Parliament and the Council are fully involved. Adapting legal and administrative measures to target fraud and irregularities and protect the EU’s financial interests is a continuous, ongoing process. As the European integration project moves forward and as the economic international landscape changes, new challenges emerge. Dealing with them requires new instruments and tools. New trends and patterns have emerged in the ways in which fraud is committed 79 . Fraudsters exploit all opportunities offered by the single market, the globalised economy and new technology. As shown by this and previous years’ reports, Member States have been focusing their efforts in particular on preventive and detection measures. At EU level, European legislators, following specific initiatives by the European Commission, are trying to address the threats posed by the increasing cross-border dimension of fraudulent activities 80 . The establishment of the EPPO will provide a more efficient action to counter those fraudulent activities. The measures taken at EU level in 2016 further strengthened the protection of the EU’s financial interests. The revised Regulation 515/97 serves as a powerful tool for stepping up the fight against customs fraud. The joint customs operations (JCOs) conducted by OLAF continue to be an important source of information for detecting irregularities in transactions involving certain types of goods. China was the country of origin with the highest level of fraud and irregularities detected both in number of cases and established amounts. Customs control strategy involves a combination of different controls. Post-clearance controls have been reported as the most effective method of detection, both in terms of the number of cases detected and in terms of amounts. However, controls before and during clearance of goods and inspections carried out by anti-fraud services are indispensable for the detection of certain types of existing fraud, new fraud patterns and, generally, for the detection of all types of fraud. The TOR inspections carried out in 2016 on control strategy in customs valuation showed that flaws in the management and control of undervalued imports of textiles and footwear may have significant negative consequences for the EU budget. Appropriate risk profiles need to be in place; undervalued imports need to be systematically challenged and customs values corrected in line with EU regulations. ·applying the customs valuation methodology provided by customs law. As OLAF’s investigations have shown, public procurement, which remains the largest channel of public spending, is an attractive marketplace for fraudsters, who use corruption and offshore accounts to facilitate fraud. Many procurement fraud cases are transnational, as the new fraud scenarios often involve a contracting authority from one Member State and bidders from several other Member States who subcontract their works to companies in different countries 81 . Over the last five years, 20 % of all reported irregularities have been related to breaches of public procurement rules, accounting for 30 % of all reported irregular financial amounts. The Public Procurement Directives should have been transposed by 18 April 2016, to introduce a modernised and streamlined legal framework. Eleven Member States have yet to transpose the three Public Procurement Directives in full. ·make use of the possibilities offered by simpler rules and fully realise the potential of e-procurement, which will become mandatory by October 2018. Looking at the detections reported by national authorities over the last five years for the main expenditure sectors, there is no significant divergence from known patterns. There are small variations in annual programmes, such as those financed by the EAGF, from one year to another. Multiannual programmes follow a different pattern, linked to the programming cycle, with a low number in the first years of the programme increasing towards its closure. This year’s analysis has been further deepened and refined to enable better targeting of specific areas at risk. This was possible because of the quality of the reported data, which is progressively improving. However, more improvements could be made. ·When reporting irregularities (fraudulent and non-fraudulent), all competent authorities are asked to provide information about the location and, for cohesion and fisheries policies, the priority area of the measures/projects affected. ·When updating irregularities previously reported, Member States are also asked to provide this information if they have not done so already. Direct payments financed by the EAGF form a relatively low-risk policy area, in terms of fraud and irregularities detected and reported by Member States. Fraud detection in market support measures is higher than in any other policy areas 82 . For EAFRD programmes, the level of irregularities and fraud detection by the competent authorities is similar to that of other shared management areas. 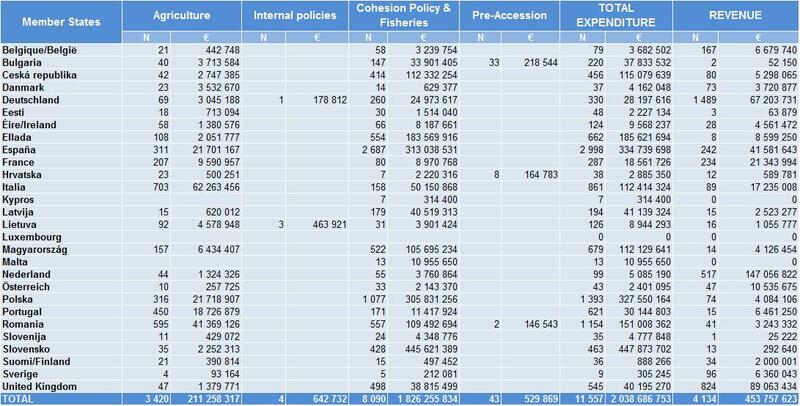 For cohesion policy, analysis of the 2007-2013 programming period points to a higher detection rate for convergence objective programmes. An unusually low detection rate is found for ETC programmes. Specific priorities are identified as riskier 83 . ·All Member States are invited to take into account the findings of this report in their fraud risk assessments for the programming period 2014-2020 and to pay particular attention to the priorities highlighted and to interventions which are similar in scope and nature. ·In view of the low detection results for ETC programmes and considering the increasing threat of transnational fraud, Member States are asked to increase their attention and cooperation. ·All Member States are asked to review their fraud risk assessments in relation to market support measures, taking into account the information highlighted in this report. There is increasing awareness of the threats posed by fraudsters and the difficulties for single national authorities of coping with the cross-border dimension of the schemes put in place. This translates into growing willingness to share information and best practices and, within adequate legal frameworks, relevant data. The EU and its Member States are now better equipped than a few years ago and there is increasing commitment to do even more. In 2017, the Council and European Parliament will adopt the PIF Directive, further harmonising their approaches and embracing the European dimension of combating VAT fraud. At least twenty Member States will move even further, setting up the EPPO on the basis of ‘enhanced cooperation’, to specifically address fraud and other crimes affecting the EU’s financial interests. When the EPPO is established, there will be two EU bodies conducting investigations in this area. OLAF and the EPPO will need to work in partnership to increase the protection of the EU’s financial interests within their respective remits for administrative and respectively criminal investigations. The Commission is committed to maintaining a strong OLAF and the ongoing evaluation of Regulation 883/2013 will offer a new opportunity for much needed reflection on how to further strengthen its investigative powers. The number of irregularities reported as fraudulent measures the results of Member States’ work to counter fraud and other illegal activities affecting the EU’s financial interests. Therefore, the figures should not be interpreted as indicating the level of fraud in the Member States’ territories. Totals differ from Table 1 as Annex 1 does not include third countries (pre-accession) and direct expenditure. Totals differ from Table 2 as Annex 2 does not include third countries (pre-accession) and direct expenditure. (v) Annual overview with information on the results of the Hercule III Programme in 2016. (2) Council Act of 26 July 1995 drawing up the Convention on the protection of the European Communities’ financial interests, OJ C 316, 27.11.1995, p. 48. (3) All 28 Member States except Denmark and the United Kingdom. (5) European Partners Against Corruption (EPAC) / the European Contact-Point Network Against Corruption (EACN). (7) COM(2016) 605, Proposal for a Regulation of the European Parliament and of the Council on the financial rules applicable to the general budget of the Union and amending Regulation (EC) No 2012/2002, Regulations (EU) No 1296/2013, (EU) 1301/2013, (EU) No 1303/2013, EU No 1304/2013, (EU) No 1305/2013, (EU) No 1306/2013, (EU) No 1307/2013, (EU) No 1308/2013, (EU) No 1309/2013, (EU) No 1316/2013, (EU) No 223/2014,(EU) No 283/2014, (EU) No 652/2014 of the European Parliament and of the Council and Decision No 541/2014/EU of the European Parliament and of the Council. (8) Extending the Commission’s power to act with regard to the Early Detection and Exclusion System in direct and indirect implementation (see also section 7). (9) E.g. with the National Anti-Corruption Bureau of Ukraine and with the Belarus and Taiwanese customs authorities. (11) See COM (2017) 351 final, Part 2/2, p. 79. (12) Regulation (EU) No 250/2014 of the European Parliament and of the Council of 26 February 2014. (13) Commission Decision C(2016) 868 of 17 February 2016. (14) For details, see SWD under footnote 1(v). (15) For details, see SWD under footnote 1(i). (17) The nine Member States are: Bulgaria, Croatia, Czech Republic, France, Greece, Hungary, Italy, Malta and Slovakia. In addition, Latvia and Romania adopted a NAFS and sent it to the European Commission in the first quarter of 2017. Belgium, Netherlands and Poland reported that a procedure to draft a NAFS is ongoing, while Austria and Lithuania indicated the adoption of specific strategic documents. (18) OJ L 94, 28.3.2014, p. 1. (19) OJ L 94, 28.3.2014, p. 65. (20) OJ L 94, 28.3.2014, p. 243. (21) Bulgaria, Czech Republic, Greece, Spain, France, Cyprus, Latvia, Hungary, Romania and Estonia. (22) COM(2016) 472 final, 14.7.2016, pages 29-31. (23) Customs Risk Management System. (25) Database for irregularity reporting in traditional own resources. (26) ARACHNE is a risk scoring IT tool for the ERDF, CF and ESF, developed by the European Commission put at disposal of national authorities. (27) Belgium, Bulgaria, Germany, Spain, France, Italy, Cyprus, Hungary, Poland, Romania, Finland and Sweden. (29) The Czech Republic, Denmark, Estonia, Ireland, Spain, France, Croatia, Italy, Cyprus, Lithuania, Hungary, the Netherlands, Poland, Romania, Slovenia, Slovakia, Finland and Sweden. (30) Belgium, Denmark, Germany, Estonia, Ireland, Greece, Spain, France, Italy, Cyprus, Hungary, the Netherlands, Poland, Slovakia and Sweden. (31) Belgium, Germany, Estonia, Spain, France, Italy, Cyprus, Hungary, the Netherlands, Poland, Sweden and the United Kingdom. (32) Spain, France, Lithuania, Austria, Finland and the United Kingdom. (33) Belgium, Bulgaria, the Czech Republic, Denmark, Germany, Estonia, Greece, Spain, France, Croatia, Italy, Cyprus, Latvia, Lithuania, Luxembourg, Hungary, the Netherlands, Poland, Portugal, Romania, Slovenia, Slovakia and the United Kingdom. (34) Ireland, Malta, Finland and Sweden. (35) Belgium, Bulgaria, the Czech Republic, Denmark, Germany, Estonia, Ireland, Greece, Spain, France, Croatia, Italy, Cyprus, Latvia, Lithuania, Luxembourg, Hungary, Malta, the Netherlands, Poland, Portugal, Romania, Slovenia, Slovakia, Finland, Sweden and the United Kingdom. (36) For details, see the SWD, footnote 1 (iii). (37) For a detailed analysis of the reported irregularities, see the SWD, footnote 1 (ii). (38) This indicator is described as the fraud frequency level (FFL). See section 2.3.2 of the Commission staff working document Methodology regarding the statistical evaluation of reported irregularities for 2015 SWD(2016) 237 final. (39) This indicator is described as the fraud amount level (FAL). See footnote 38. (40) OJ L 243, 18.9.2015, p. 1. (41) OJ L 82, 22.3.1997, p. 1. (42) OJ L 126, 14.5.2016, p. 1. (43) OJ L 65, 11.3.2016, p. 38. (44) OJ L 65, 11.3.2016, p. 40. (46) The CSM directory contains information on the physical movements of any container imported by a maritime vessel into the EU, and of exported containers containing excise goods. This information, in the form of CSMs, is sent by the carriers directly to OLAF. (47) The results will be discussed at the meeting of the Expert Group on Mutual Assistance in Customs Matters to be held on 29–30 June 2017. (48) Customs procedure 42 provides for non-EU goods to be released into free circulation in an EU Member State exempted from import VAT on condition that the goods will be transported to another Member State in an intra-Community transaction. (49) * This designation is without prejudice to positions on status, and is in line with UNSCR 1244/1999 and the ICJ Opinion on the Kosovo declaration of independence.More than 70 agreements are currently in place, including major EU trade partners such as the US, China and Japan. (55) Proposal for a Council Directive amending Directive 2006/112/EC, COM(2016) 811 final. (56) Information concerning recovery of TOR amounts affected by fraud and irregularities is given in the SWD, under footnote 1(ii). (62) 2015 was an unusual year: see sections 5.1 and 5.3.2 of the 2015 Annual Report to the European Parliament and the Council on the Protection of the EU financial interests and the fight against fraud, (COM(2016) 472 final), http://ec.europa.eu/anti-fraud/sites/antifraud/files/pifreport_2015_en.pdf . (63) The programming period closure started at the end of March 2017. (64) Referred to in the system as ‘OLAF notified’ cases. (65) The AMPR is part of the EU budget integrated financial reporting package, COM(2017) 351 final. (66) This document still needs to be finalised and formally adopted. (67) Regulation (EU, Euratom) No 2015/1929 of the European Parliament and of the Council of 28 October 2015, OJ L 286, 30.10.2015, p. 1. (68) Also see COM(2017) 351 final, Part 2/2, p. 79-80. (69) For the situations referred to in Article 106(1)(c) to (f) of the Financial Regulation (i.e. grave professional misconduct, fraud, serious breaches of contractual obligations, or irregularities). (70) Panel referred to in Article 108(5) to (10) of the Financial Regulation: Regulation (EU, Euratom) No 966/2012 of the European Parliament and of the Council of 25 October 2012 on the financial rules applicable to the general budget of the Union and repealing Council Regulation (EC, Euratom) No 1605/2002, OJ L 298, 26.10.2012, p.1, lastly amended by Regulation (EU, Euratom) No 2015/1929 of the European Parliament and of the Council of 28 October 2015, OJ L 286, 30.10.2015, p. 1. (71) The authorising services can be that of EU institutions, agencies and bodies. (72) More information on the Panel is included in the SWD, footnote 1(iv). (73) As of 30 June 2017, the Panel had issued 17 recommendations, three of which were adopted in 2016. In one case, the facts presented to the Panel were not established. In three recommendations, the Panel concluded that no sanctions should be imposed, in the light of the remedial measures taken by the operator. For further details see the SWD on EDES and its annexes. (74) Data provided in the SWD footnote 1(iv). (77) An in-depth descriptive analysis is available in the SWD, footnote 1(ii). See sections 4.2.2.3 and 4.2.2.4. (80) The OLAF Report 2016. (81) The OLAF Report 2016. (82) See section 4.1.2 for the specific market support measures identified.